Solar Photovoltaic Technology Production: Potential Environmental Impacts and Implications for Governance provides an overview of the emerging industrial PV sector, its technologies, and the regulatory frameworks supporting them. This new book reviews and categorizes the potential environmental impacts of several main PV technologies, examining the extent to which current EU governance frameworks regulate such impacts. 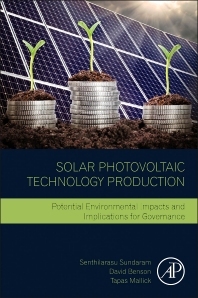 By identifying the gaps or regulatory mismatches and creating a basis for normative recommendations on governance change, this book analyzes potential governance implications and their impacts in relation to manufacturers upscaling PV production techniques. 5.3 Normative Sustainability Principles for Global Solar PV Governance? Dr. Senthilarasu Sundaram graduated in physics and did his PhD-thesis in photovoltaic materials in 2006. Since then his professional activities have been dedicated to the development of photovoltaic materials and renewable energy systems with special emphasis on thin film solar cells, dye sensitised solar cells and perovskite solar cells technologies. Dr. Sundaram has been in the field of photovoltaic materials and solar cell device architecture for the past 15 years since he started his PhD career at Bharathiar University, Coimbatore, India. Dr. Sundaram is an expert in materials design and engineering for solar cell devices. He is a Lecturer at the Environment and Sustainability Institute (ESI) at the University of Exeter since 2013. Currently, his research focuses on the development of nanostructured solar cells, especially dye sensitised solar cells and perovskite thin film solar cells through low-cost fabrication techniques. He is concentrating specifically on scaling up engineering challenges in novel solar cells, system level integration and spectral dependence analysis. Prof. Tapas Kumar Mallick, PhD, is currently the Chair in Clean Technologies within the Environment and Sustainability Institute (ESI) and Academic Lead in Renewable Energy, University of Exeter, UK. He is also adjacent Professor at the Department of Mechanical Engineering, Indian Institute of Technology, Madras, India. His research span over various aspect of solar photovoltaic technology, especially high efficiency and low cost device and integrated renewables. He has published over 180 research articles on solar technology and has given over 80 academic presentations in 13 countries. Prof. Mallick is the Editor-in-Chief of “Advances in Renewable Energy Journal” and Editor-in-Chief of Editorial Boards for Energy Sources in the Journal of ‘Energies’.